I been feeling better in the last week and decided to pick up on my photography. Today I continued with my model series. I attended a gathering of Flickr photographers to shoot some vintage military vehicles. I spend some time photographing model Zuri. It is hard to light correctly outside during mid day. I hate it! Although I must say most pictures came out OK, but I was not able find my groove. But it was nice to spend some time with some good friends here in Burque. You are a pretty vulnerable girl travelling on your red BMW through a dark deserted road and suddenly the car stalls on the side road. 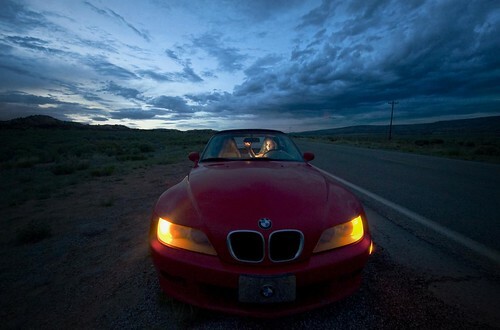 Looking ouside from the safety of your car is dark, desolate, threatning and unforgiving. You wonder what lurks in the shadows of the night? You wonder what made your car died in the middle on nowhere, but being a high class girl, the cause is a mystery beyond comprehension. Today I along with fellow photographer Kevin did a photo shoot at the Albuquerque railyards. We had two models, the first was Miss Minie. She was pleasant to work with and very professional. 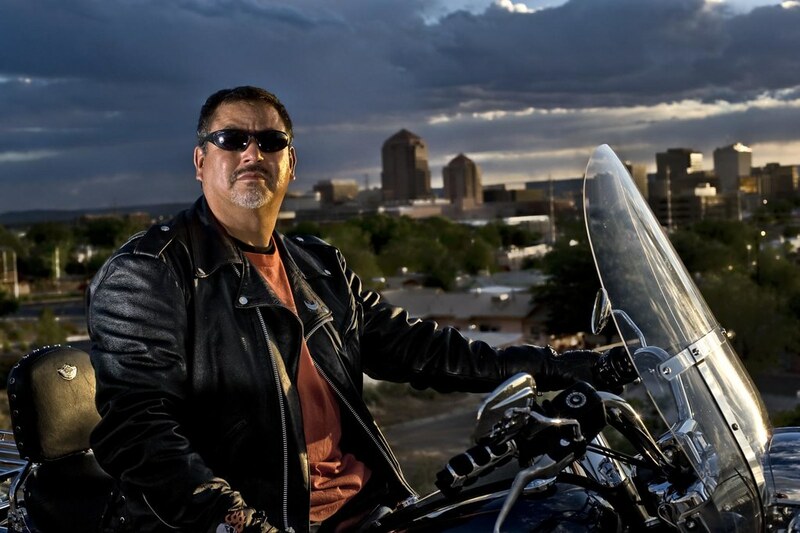 Tonight we did a photo shoot with Perico and his motorcycle over the city of Albuquerque. I been wanting to do this photo shoot for a while, and we finally connected to do it. I am glad we did. The location was on the side of the road on a dirt patch with little room to move around. The wind was not a problem, although I did tip one of my lights at one time. We shot at sunset and at night overlooking the skyline of Albuquerque. I want to thank the girls, Vero and Maria for helping me create some great magic. I really enjoy myself when the girls hang out with me, it is truly a joy to be among their company. Everytime I ask them for help, they are always there, and I do appreciate everything they do. I thought the photographs came out great. Here is Perico wearing the jacket with the Marentes insignia. I was also able to get the girls in the action. Here is Vero riding on the back of the bike. And not to be undone, Maria was a natural. The girls were great, we went to go eat dinner at Frontier afterward, I had a blast! Anyhow, you can view more pictures and buy prints HERE. The first photograph made it to the portfolio, yay!